Whenever I happen to stop in a Hallmark store, I’m just astounded as to the wide variety of greeting cards on display in there. There are cards for birthdays, wedding anniversaries, bridal showers, engagements, weddings, new babies, job promotions, new jobs, good-byes, graduations, passing a big test, recovering from illness or surgery, sympathy, apology, christenings, baptisms, bar mitzvahs… and that doesn’t even touch the seasonal cards, like Veteran’s Day, Mother’s Day, Father’s Day, Christmas, and so on. All of these cards are there to express the same basic sentiment: that you’re thinking of someone during some special occasion. Don’t get me wrong, that sentiment is a great thing. It’s wonderful when people take the time to think of each other on important occasions. My trouble is that the sentiment that they express can just as easily be expressed without spending money on a greeting card. It can be written as a letter or on a very inexpensive blank card. The idea here isn’t to be cheap, not at all. In fact, all things being equal, I prefer the idea of handwritten notes to purchased greeting cards. Here’s why you’ll find me avoiding the Hallmark store. The sentiments expressed on a greeting card might be beautiful or inspirational or humorous, but those sentiments were written by a greeting card writer. It’s not written in the hand of a person who cares about me, nor is it in their words. A handwritten note, expressed in the words of someone who cares enough to send that note, means light years more to me than any purchased greeting card can ever possibly mean. A note like that carries authentic meaning. I have a collection of notes I’ve received from people over the years. They’re not saved because the original greeting card had a great sentiment printed on it. They’re saved because the person who gave me the note took the time to write out a personal thought and shared that with me. That’s valuable. That means far more than a Hallmark creation. Blank 5″ by 7″ note cards tend to work perfectly for this. I buy them in bulk, as I can get 50 such blank cards for $8.50, knocking the cost per card down to $0.17. If you shop around at the dollar store, you can probably find an even better bargain. These cards are almost the perfect size. If I want to write a lengthy note, I can usually fit it into one card, but I can also space out my words as much as I like. It gives me perfect dimensions for almost all of the ideas I describe below. I’m a writer. I practice the art of coming up with the right words all the time, so I usually find it at least somewhat easy to think of things to write whenever I send a handwritten note. For many people, it’s a lot harder. It can be a struggle to find words to express something that you want to share. Here’s a solution to that problem that even I use on occasion. I simply choose a poem or a quote from an online source that I find particularly meaningful and I copy it down in my own handwriting, attributing it to the source. I tend to really like the poetry of Walt Whitman and I often look at Bartleby.com when looking for other poets and quotes. There are far more poems out there than there are greeting cards, giving you far more room to find the perfect sentiment than in the greeting card section. Sometimes, people might feel cheap giving a blank homemade card to a child. If that describes you, simply put two dollar bills inside the card and write a note to them saying that you thought they would enjoy the $2 more than Hallmark would and wish them a happy birthday. I like to put snippets of Shel Silverstein poems on cards to children. For example, I find that boys who can read on their own think that a picture of a snake alongside The Boa Constrictor Song makes for a hilarious card, far better than the other cards they might get. If it also includes two dollars, you’re probably winning the day by a mile. Sometimes people might prefer the visual nature of greeting cards, which might include a funny cartoon on the front or a nice picture of a natural scene. If that’s part of what you look for in a card, simply collect pictures and images that you like and save them for cards at a later date. It’s easy to make them look classy. Just cut them to dimensions that fit nicely and proportionately on the front or the inside of your note cards. 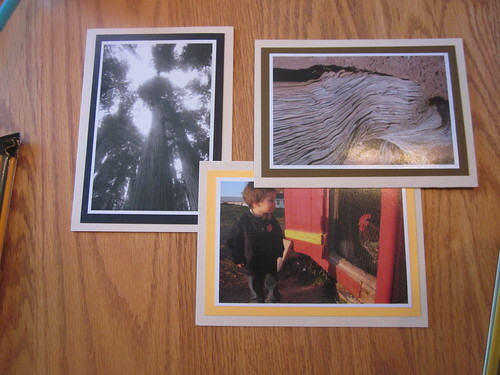 If you use 5″ by 7″ note cards, for example, cut the images down to a 4″ by 6″ size. In fact, that 4″ by 6″ size is a perfect way to use unwanted photo prints – just affix them to the front of a 5″ by 7″ card with some rubber cement. 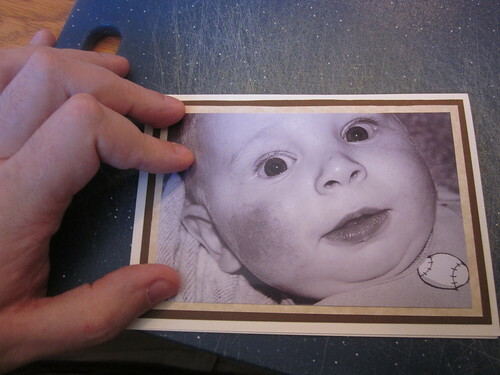 If you don’t have any photos you like but you have a home photo printer, just find a great image online and print it on a 4″ by 6″ photo, then affix that to the front of a 5″ by 7″ note card. Perfect! If you want to get really classy, you can use a technique I used when making personalized handmade stationery. Simply choose some 4″ by 6″ prints that you like, then cut out a 4 1/2″ by 6 1/2″ rectangle of construction paper in an appropriate color that matches the print that you want to use. Paste the construction paper to the front of the card (as centered as possible), then paste the print on top of that. It’s really easy to make layered effects like these, creating a beautiful card for perhaps thirty cents in supplies. Then, on the inside, you can add whatever handwritten sentiments that you wish. It’s hard to find a more meaningful image for a card than a picture of you with the recipient, or an image (humorous or otherwise) of a person that you both care deeply about. There might be situations where it feels cheap to send a blank card, for whatever reason. If that’s the case, avoid sending a card entirely. Get out a sheet of blank paper and write a letter by hand. A handwritten letter looks very classy and achieves the same emotional effect as a handwritten card. It shows that you took the time to care about the recipient and think carefully about your words. My belief is that the big reason the greeting card industry is successful is that it provides a convenience. It takes time to write a handwritten note, whereas a card already has the sentiment on it, ready to go. Yet, it’s not quite that easy. How often do you spend browsing through greeting cards looking for the “perfect” one that says what you want? That’s no different than the time you might spend thinking about what to write or looking up a poem online. What about the time invested in making a nice card with a custom picture on the front? You can simply do those in batches in your spare time. It’s easy to assemble them while watching a movie or television show. After that, you’ll have a box full of amazing handmade cards. You can also just bookmark good poems and quotes as you find them so that you can refer to them later on when you’re looking for a good poem or quote for a card or a letter. Once you have a box of blank cards and perhaps a few with pictures on the front and you have some poems and quotes bookmarked on your computer, you’ll find that you prefer grabbing one of those to going to the store. Once that initial threshold of work is finished, the homemade cards become more convenient. Let’s say that our family buys two cards for Valentine’s Day, three cards for Mother’s Day, three for Father’s Day, and five other cards spread throughout the year. Let’s also say that they average $3 in cost, but a homemade card averages a cost of $0.50. That simple move turns $39 in expenses into $6.50 in expenses, saving you $32.50. However, the real reason I like handwritten cards is that they feel much more meaningful. The sender took the time to hand-write the sentiment that they want to share with you. They thought about the words or the exact poem or quote they wanted to share. If the reason you’re grabbing a card is to show someone you care, you’ll show them that you care even more with your written hand. The fact that you’ll save a few bucks is just a bonus incentive.